Power Panel’s donation of a Gen-2-0 brings electricity and hot water to the community of Dos Bocas, Puerto Rico. It is powerful and rewarding to witness how quickly this lifesaving technology can transform an area devastated by natural disasters like Hurricane Irma. Last year’s hurricane season was seemingly relentless, and on September 20, 2017, Puerto Rico received a devastating blow in the form of Hurricane Maria. A Category 4 hurricane, Maria had maximum sustained winds of 145-155 mph and brought catastrophic loss, fatalities, extreme structural damage and power outages across the island. Fast forward nearly four months later, and there are still residents who are lacking hot water, warm showers and the power needed to pull their lives and communities back together. While relief efforts have been underway since Hurricane Maria struck, recovery has been a long process due to a variety of factors including lack of resources, underdeveloped roadways and weakened infrastructure. For this reason, Power Panel decided to get involved and provide relief by donating an easily deployable mobile solar-thermal generator, the Gen-2-0. 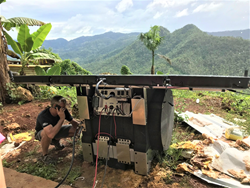 Through its affiliation with the Solar Energy Industries Association (SEIA), Power Panel joined Good360, Crisis Response International (CRI) and related volunteers to deliver and install the Gen-2-0 in the small community of Dos Bocas, Puerto Rico. On January 27, 2018, Power Panel installed the Gen-2-0 and provided training to the community and volunteers who will be using it. Within just a few short hours, the unit had been installed and power and hot water was made possible to families who had not had a hot shower in more than four months. According to John Marshall III, a CRI first responder onsite during the installation, “the Gen-2-0 was very easy to set up, logical and simple...” He stated that while the residents greatly appreciate the electricity, “taking a hot shower after four months of showering in cold mountain water was sheer joy; it brought back a comfort of home that had been lost and helped restore normalcy.” He continued by noting that while they started by powering one home, now three homes are being powered and a community shower has been set up, as well as an added hot water cooker. Additionally, the USB connectors make it possible for a community that is reliant on cellular phone service to charge their phones. Donations of solar-thermal generators are crucial to the recovery of hurricane-impacted communities and Puerto Rico. According to a recent impact report by Good360, Power Panel’s donation of the Gen-2-0 made a positive impact on 1,000 lives, and the potential impact continues to grow. The energy and thermal power offered by the Gen-2-0 is only as limited as the sun which means that benefits will continue far beyond this month or year. About Power Panel: Based in Detroit, Michigan, Power PanelTM is a leading innovator in turnkey solar technology solutions that can scale easily and deploy quickly to meet energy production needs. The company’s hybrid solar-thermal technology is four times as powerful as traditional solar technologies and captures 80% of the sun’s energy.